The MF 6600 Series from Massey Ferguson introduces the highest power four cylinder tractors on the market. The MF 6600 Series offers users the power, torque and operating benefits associated with a six-cylinder tractor in a four-cylinder compact and extremely agile tractor with a great power to weight ratio. 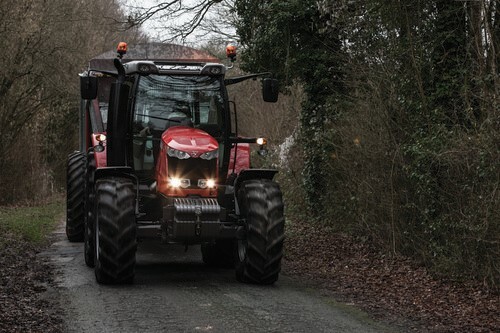 Fitting in between the MF 5600 Series and the awarding winning MF 7600s, it offers a high level of standard specification with a wide choice of transmissions, hydraulic systems and cab comfort to suit their specific requirements. As well as sharing a similar size and style of cab as the MF 7600 Series, the MF 6600 Series is also available with Dyna-4, Dyna-6 or Dyna-VT transmissions and in Essential, Efficient or Exclusive cab specifications. Together these provide 10 different variants.